I am honored and humbled by the comments below. I love biomechanics. I thank this nice patient from sending in this compliment. 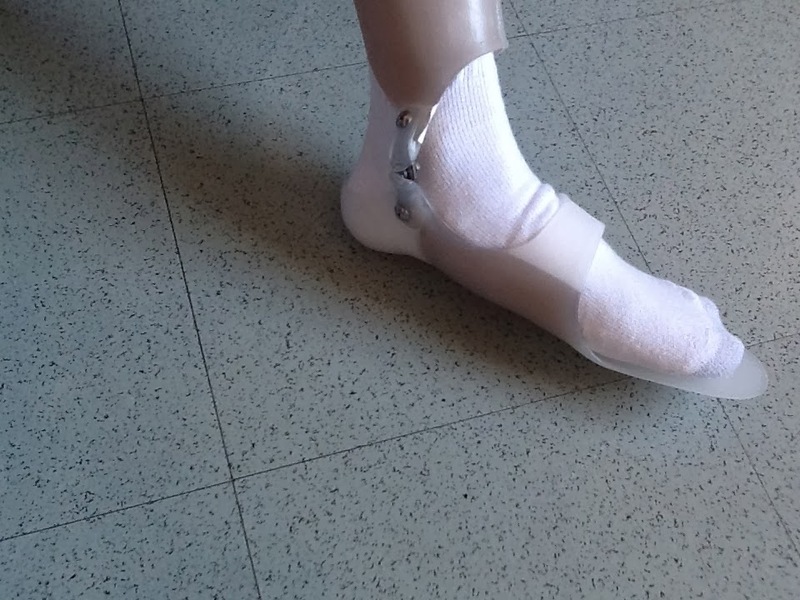 Orthotic devices can do so much to help patients. I make my own orthotic devices, not only because I love that work, but I love to experiment. I love to see the process from start to finish-- from taking the impression cast to dispensing the devices. Dear Dr Blake: Recently I saw a podiatrist at Kaiser to just learn more about what their podiatry department has to offer. The podiatrist I saw told me that he followed your career and that you are the best orthotics person in the country. We, your other followers, already know that of course! But this is also to say again thank you for your dedication and helpfulness to your patients. I am trying to work with my flexible hammer toes. Will come in for visit as my old orthotics are getting worn out. Thanks. This is a terribly complex equation at times. And, at times, each foot need very different support. And, at times, corrections are contradictory (i e. the need of flexibility and rigidity at the same time for different reasons). As I exam my patients, it is often after I give them an initial orthotic device, and get their feedback, that it is apparent that major changes are needed. What I thought was important initially was incorrect or just must take the back burner to a more important issue. This is the Art of Biomechanics that I live in, and love. When you are making orthotic devices, you need to know how to work with your lab to have 3 or 4 levels of change in each of the categories above. That will make you successful with 95% of your patients needs. For Example, your initial "standard" orthotic device has a certain amount of shock absorption qualities. But, could you improve on that shock absorption in 3 more layers of complexity: more motion, more cushion, more support. Yes, the better the foot contacts the orthotic device, the better the plastic absorbs the stress away from the body and on to the device. The vertical ground reactive force gets transferred less up the leg and more out the end of the shoe. We can go on and on about all the modifications to biomechanical support that can be made to improve someone quality of life. I hope this gets everyone thinking in these terms. "We are truly limited by our Imagination in this field", and sometimes I have a good imagination. Every cold season I have one patient at least who tears a tendon in their foot or ankle while on, or just coming off, Cipro. I tell my patients to be very conservative in their workouts up to 2 weeks after they have stopped the antibiotics. Hey Dr. Blake! Hope 2014 has been good for you so far. So I was doing really well with my recovery (after another foot injury), but I may have tried to do too much too soon. I have a new issue with my RIGHT foot (first injury was on this foot) and something going on with my LEFT foot now too! I attached a pics (RIGHT foot is BLUE marker, LEFT foot is red marker). RIGHT: Big X is new pain (the dot is the old, original injury). New pain feels like a sharp electric shock on one particular nerve every time I put pressure on the area (i.e taking a step, pressing on it). It's a tiny bit swollen. I don't feel any pain when there's no pressure on it. It started one day when I took a step. Nothing happened at that moment, no quick move or anything that I would connect to an injury. It was very faint at first. Then as time went on, it felt "stronger." In the weeks BEFORE I felt it, I was recovering from the first injury (blue dot). I was increasing my walking time/distance, experimenting with shoes other than sneakers (some high heels) around the house. The foot felt great, but weak. Then this new "zinging" little pain thing!! I tried to ignore it but I can't, hurts too much. After much experimentation and remodels, I have rigged a gel insert to support the area all around the Blue X. Problem is, my old injury (blue dot) is starting to hurt again, maybe from wearing this new rigged padding. I attached a pic of the rigged padding. Dr Blake's comment: yes, you must have the original area "dot" within the hole also. Dr Blake's comment: When making an accommodation or float for the bottom of the foot, always go with the horseshoe concept like with right foot. The hole technique can make the swelling much worse as the swelling does into the hole and has no room to escape. This is one of the best AFOs (ankle foot orthoses) I have seen for posterior tibial tendon dysfunction. It is hinged so it allows for some or no ankle motion (basted on how much pain!). The leg part is placed in a varus position for better pronation control. The plastic is wrapped around the arch for superb support. I looked high and high for a manufacturer and could not find one. If you are suffering from PTTD, show this to the brace guy/gal and see if they can do something like this. The foot bed part is pretty standard. My name is Sophie. I live in Chicago, IL. I am 30 years old. And when I turned about 25, I began seeing symptoms of peripheral neuropathy. I have burning, numbness, tingling, and pins in needles in my feet and legs. Decreased sensation to temperature in my legs. It's all of an unknown cause. So it's very scary. I do not have diabetes and have been tested for dozens of other illnesses, all of which come back with clean test results. Which is great. I have read a lot of your blog. I need a doctor of your caliber to see on a regular basis. Do you know of anyone in the Chicago-area that operates their practice like you do? It seems so important to you to look at the big picture, spend LOTS of time listening and advocating for your patients. Just curious if you had a referral in my area. I'll continue to research, read your blog and stay hopeful! Dr Blake's comment: I am sure someone on this member list of the American Academy of Podiatric Sports Medicine shares my philosophy. Here is the link. Unfortunately, I do not know someone directly. You could also call the William Scholl College of Podiatric Medicine in Chicago and see whom specializes in peripheral neuropathy. Make sure your bone density is great. Thursday's Orthotic Discussion of the Week: Why I love my oldie moldies!!! This wonderful young lady has very severe pain around her big toe joint. My initial orthotic devices just did not give her enough support. So, back to the lab as they say. You can se how I marked to dramatically increase the support under the medial arch and first metatarsal. Here I also set the metatarsal arch longer and higher. The goal is to increase the pressure on the 2nd and 3rd metatarsals and off weight the first metatarsal/bunion area. 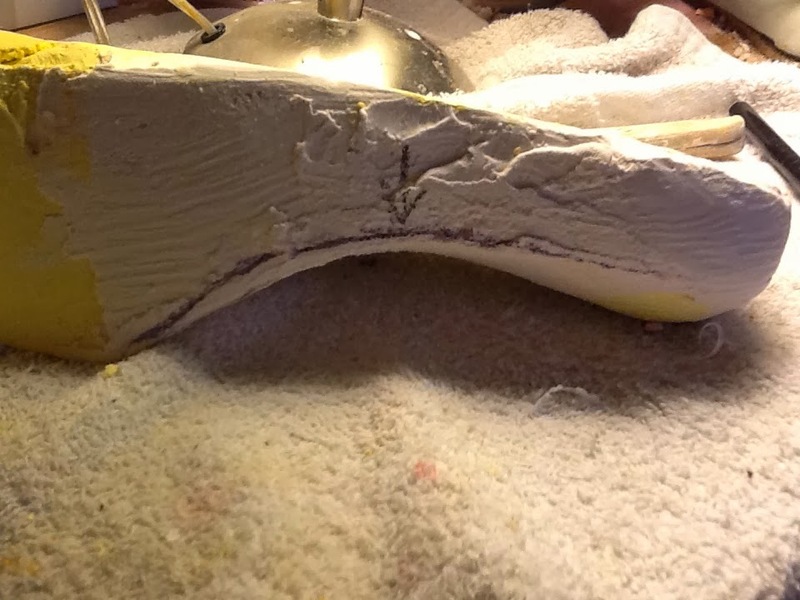 Another view of the opposite foot where the markings tell the lab to remove more arch plaster, thus making an orthotic device with a higher medial arch. An average view of my lab with several pairs of Inverted Orthotics being made. 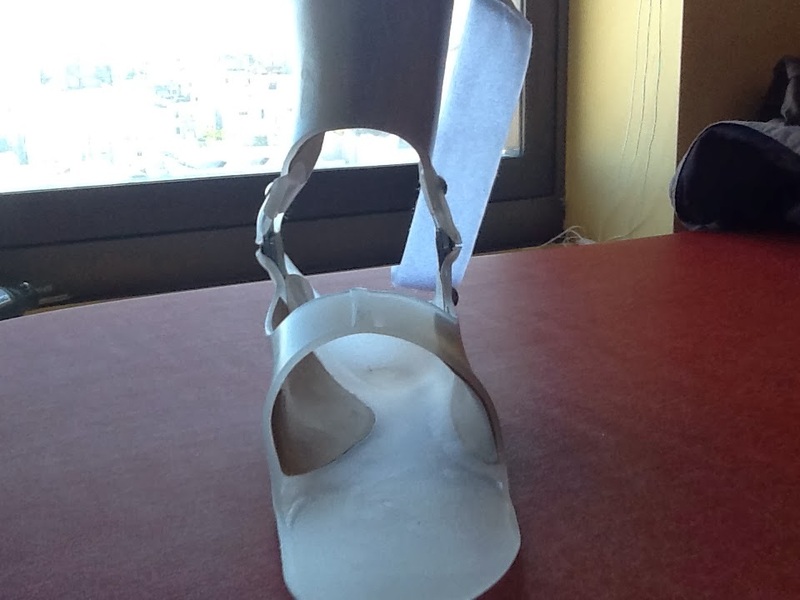 Orthotic devices are made from negative casts of plaster of paris. Then, these casts are poured to make positive casts. Then, the prescribing health care provider tell the lab how to make the positive cast to correct what is wrong with the patient. This is quite a skill. 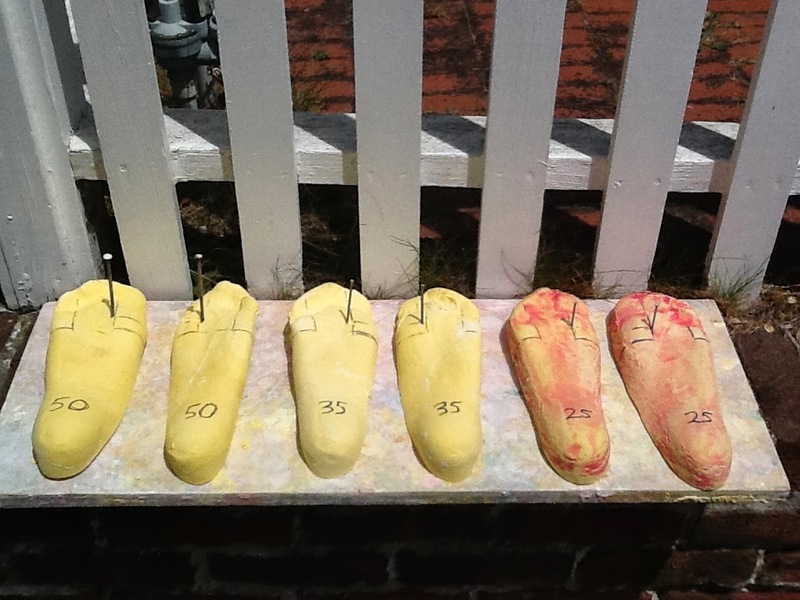 You can see each of these molds are individually made to uniquely represent a corrected foot. I love my molds that have unlimited possibilities!!!!!!! If you are a hiker, consider walking poles to help ease the stress on your spine and lower extremities. My patients have greatly benefited from these, and they greatly reduce the stress on all weight bearing muscles and joints. This study confirms what hikers have felt, but realize these studies are very hard to do (and some contradict others). RPE stands for Rated Perceived Exertion and HR is Heart Rate. I realize this and the last email may have to fall to wayside of priorities of interest for you or patients and understandingly so. I have not received any recent x-rays or mri's to lead to any truly definitive idea of what is going on here with this pain that arose abruptly one morning as a sharp stabbing in the frontward area of my left (outside) ankle. The same ankle that was fractured roughly 18 years ago which was found out by an MRI about 12 years after the accident. The MRI did show several bits of bone fragment floating around in the vicinity of my ankle. Dr Blake's comment: Definitely old bad ankle sprains with or without fractures can resurface 15-20 years later. The thought is that the original injury caused some small micro trauma to the cartilage which slowly degenerates leading to arthritic pain. The ankle has as I explained been tempermental with occasional swelling front and back of it and often if doing a lot of outward toe pointing as in pilates or wearing a boot or shoe that crosses the area it will become irritated and sometime "catch" with a sharp pain to follow that usually mellows out rather quickly. Dr Blake's comment: Catching in the ankle can be a sign of a loose bone fragment (called a loose body) that is moving and occasionally getting in the way. This may require surgery to remove. It can also be a sign of some ankle weakness and overall wobble, so that the joint line (synovium) occasionally gets caught between two bones. This soft tissue impingement requires icing, some PT, and a lot of strengthening. The muscles/tendon must stabilize the joint which may have compromised ligaments. Prolotherapy, sugar water injections, into the ankle ligaments to irritate and scar is being used more in an attempt to avoid surgery. Well that morning about two weeks ago I awoke with that catched feeling and stood up to walk it off and to no avail. It seemed almost stuck. No moving it side to side but point toe straight out or up seemed okay. It hurt at rest as well. And swelled. The doctor did no xray and dismissed as a sprain. I applied the RICE method, arnica, epsoms, and braced it a bit. After a week it started to work it self out. More range of motion each day. Then a few days ago a little "pop" occurred while sitting on the sofa and adjusting in a pulled up leg position and voila! Any and all pain was dismissed? Dr Blake's comment: This is classic for a bone fragment. It can be mainly cartilage so unfortunately may not show up in any test. That being said, xrays, CT scans, and MRIs may be taken to get more information. The catching can actually be from the ankle joint, or the smaller subtalar joint beyond, so have no surgical intervention unless the two joints are looked at thoroughly. If you have another episode that again limits side to side motion, try a diagnostic local anesthetic block into the subtalar joint to see if it is involved. I find this interesting is all and unique but perhaps it's easily explained by someone like yourself who is so steeped in this practice of feet! ;) I've been unable to pinpoint anything as the real cause other than walking in poor footwear for too long the day before the pain began and perhaps that is all the answer I need. Proper footwear! Here is my ideal compression hose for foot and ankle swelling. They go above the knee and are open toed. This avoids so many problems with toenails. Also, below the knee compression hose actually cut off circulation in my estimate over 50% of the time. If you are wearing below knee support hose, check to make sure the upper end is not leaving an indent in your skin!!! This is a sign that they are actually causing a swelling problem, not helping one!! Walking is done with complete symmetry and reproducible timing. Analysis of Gait is important in treating all spine and lower extremity problems. Before we know how to recognize what is a problem in gait, we must know what is considered normal gait. A normal gait cycle is from Heel Strike of one Foot to the next Heel Strike of the same foot. The normal gait cycle is divided into the Stance and Swing Phases. The Stance Phase (foot is on ground) is 60% of a normal step, and the Swing Phase (foot off the ground) occupies the remaining 40%. Double Stance or Double Support is when both feet are on the ground at the same time. In Running, there is no double support phase. When both feet are off the ground, it is called the Double Float phase. The Critical Incidents in the Stance Phase to watch are Heel Strike, Foot Flat, Heel Off, and Toe Off. The Periods of the Stance Phase of Gait are Heel Strike Period (heel strike to foot flat), Midstance Period (foot flat to heel off), and the Push Off Phase (heel off to toe off). The Critical Incidents in the Swing Phases are Toe Off, Toe Clearance, and Heel Strike. The Periods of the Swing Phase of Gait are Acceleration or Initial Swing (toe off to toe clearance), Mid Swing (toe clearance to heel decent), and Deceleration (heel decent to heel strike). Heel Strike: Knee very straight with stabilization contraction of the hamstrings just prior, and contraction of the quadriceps just following (to avoid falling forward). Midstance: From foot flat to heel off, the two limbs are vertical and passing each other. My Mantra in Gait Analysis: Heel Off of one foot should occur just prior to heel contact of the opposite foot. Just prior to toe off in the Push Off Phase, the iliopsoas muscle contracts flex the hip. This leads to knee flexion which allows the foot to clear the ground. During this Push Off Phase, the foot dorsiflexors are contracting to have the toes clear the ground. Midswing is where the swing leg is passing, and going in front off, the support leg. Deceleration of the Swing Leg to slow it down for Heel Strike is caused by Hamstring and Glut contractions. Other Components of Gait to observe that are important are: Pelvic Tilt, Pelvic Rotation, Lateral Shift, Width of Base, Stride Length, and Step Length. Pelvic Tilt, Pelvic Rotation, and Lateral Shift all help to conserve energy by accomplishing a smooth motion. The Width of Base is normally 2 to 4 inches in double support. The Stride Length is the length from heel strike of one foot to heel strike of the same foot. The Step Length is the length from heel strike of one foot to heel strike of the opposite foot. Normal Gait: Stride and Step Lengths of both feet are equal. Abnormal Gait is also called a Limp and has many causes. During the stance phase of gait, pain, muscle weakness, and joint abnormalities produce there many effects causing abnormal gait patterns. Antalgic Gait due to pain shortens the support phase and increases the swing phase of that extremity. Quadriceps Weakness shows up at Heel Strike with knees bent not straight. Foot Flat Gait is where following heel strike the foot dorsiflexors are weak and allow the foot to slap hard down against the ground. Back Knee Gait is hyper-extension of the knee during midstance due to limited ankle dorsifexion (fixed or tight muscles called Equinus) or weakness in the quadriceps. Abductory Lurch or Gluteus Medius Gait (trunk 1 inch shift to one side) where the weight shifts excessively over the painful hip or away from the weakness. This is seen predominantly by trunk lean. Trendelenberg Gait used when no pain involved and the weight shits to one side due to a collapse downward of the hip during swing phase. This is seen predominantly by hip sway. Gluteus Maximus Gait is seen by posterior thrust of the trunk due to glut max weakness. Flat Foot or Calcaneal Gait where the foot is rigid and no toe off is seen. The foot is just lifted off the ground. This is also seen in Calf Muscle Weakness that limits proper push off. Swing Phase Abnormalities are Steppage Gait or Drop Foot Gait. With weak ankle dorsiflexors, the hip flexors are recruited to lift the foot off the ground with abnormal hip flexion. Hip Hike Gait with weak ankle dorsiflexors the hip is raised to allow toe clearance. Circumduction Gait like Hip Hike Gait allows the toes to clear the floor by throwing the leg out to the side. Abnormal Pelvic Rotation due to Hip Flexor Weakness to throw the pelvis forward when the hip flexors can not achieve that forward progression. Wide Based Gait to add stability. This was a comment on my You Tube Channel. I have a small circle of swelling that my doc said was over the posterior tibial tendon right in the posterior arch towards the edge of my foot. He said it doesn't feel like a fibroma and my MRI was normal, but three months later, I still have it, same size. Went to a second doctor for a second opinion and he said it was edema. I've had it for three months now. MRI was apparently normal and so was my Xray. I'm doing electrical stim and physical therapy for flexor hallucis longus tendonitis and peroneal tendonitis. I also just found out I have psoriatic arthritis. They're starting me on methotrexate and prednisone soon. Crazy how these autoimmune problems like to go after my feet! Anyways, do you know how to break up some of the scar tissue or swelling or whatever it is in that area? Dr Blake's comment: Any inflammation of the ankle joint tends to collect fluid on either side in the back or front (depends where the loosest part of the ankle joint sac is). I am glad the MRI showed no damage, and I share your frustration with the swelling. Your therapist would be the best at telling where to massage and not irritate the nerves in the area. However to work on the swelling, see if the therapist will give you a version of Tubigrip. See the video below on RICE for ankle sprains and try to develop some easy home program. Are there any gels I can put on it? Dr Blake's comment: I love ice packs and contrast bathing the best to do on some regular basis that fits into your routine. The most common prescribed anti-inflammatory gel is 1% Voltaren Gel that your doctor must authorize. Even though it is topical, you do get drugs into your system and that may not be a good idea if you are taking other drugs. One doctor should be in charge of all your drugs, and one pharmacist involved with all your drugs. I'm surprised neither of my doctors had any advice on this as it's killing me every time I put on a shoe because it rubs on the little swollen area. With peroneal tendon orthotics, it's really hard to find shoes that don't either rub the peroneal tendons or this little bump the wrong way other than crocs, which are tough to go to classes in the winter in! Dr Blake's comment: This is different since you do have pain with pressure. Silipos sells various gel sleeves that may be a great help to you in taking the pressure off the shoe. Also, do you know if methotrexate helps with tendonitis pain at all? I don't know a whole lot about all these meds or conditions because I was just diagnosed at 25 friggin years of age, but I'm having a hard time balancing a doc who's very optimistic about the tendonitis/arthritis treatment with an ortho guy who keeps telling me sometimes tendonitis just "never gets better." Scary thought, especially since even walking is really painful right now! any help or advice appreciated! Dr Blake's comment: Please see the link below. It describes the positive affect of methotrexate on tendinitis. Also, all of my patients with psoriatic arthritis seem to do just fine. You have to manage the disease well, and as early as possible, and expect a long life. Here is one link that seems to back that up. Boy, there are many hours of discussion here but I will stick to the obvious. This video shows a collapsed left arch probably following a posterior tibial tendon rupture. The posterior tibial tendon can no longer support the arch, so there she goes. Even though the patient is shown demonstrating the ability to do a double toe raise, I seriously doubt the patient could do a single leg toe raise. This helps in the diagnosis of posterior tibial rupture. 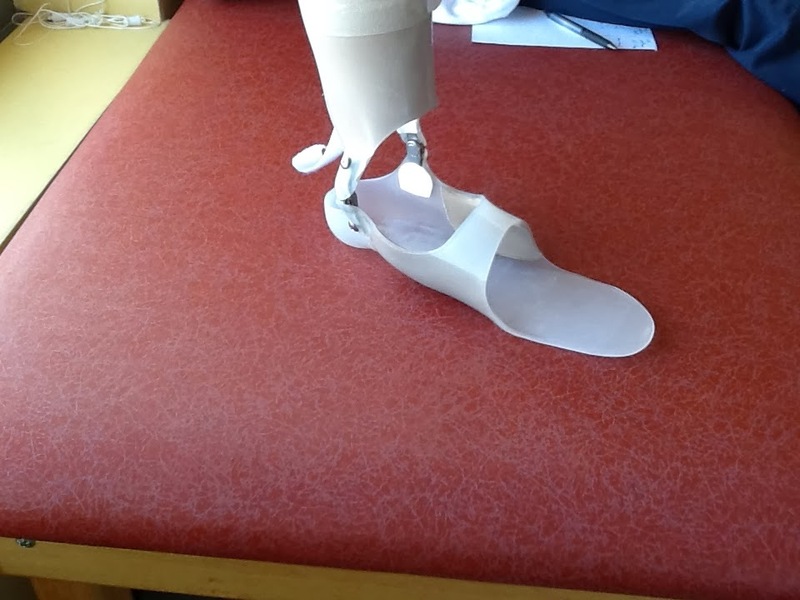 The pronation force is so great, I would go right to a 35 degree inverted orthotic device on the left side only, and a more normal device on the right. 35 degrees is my highest starting point. 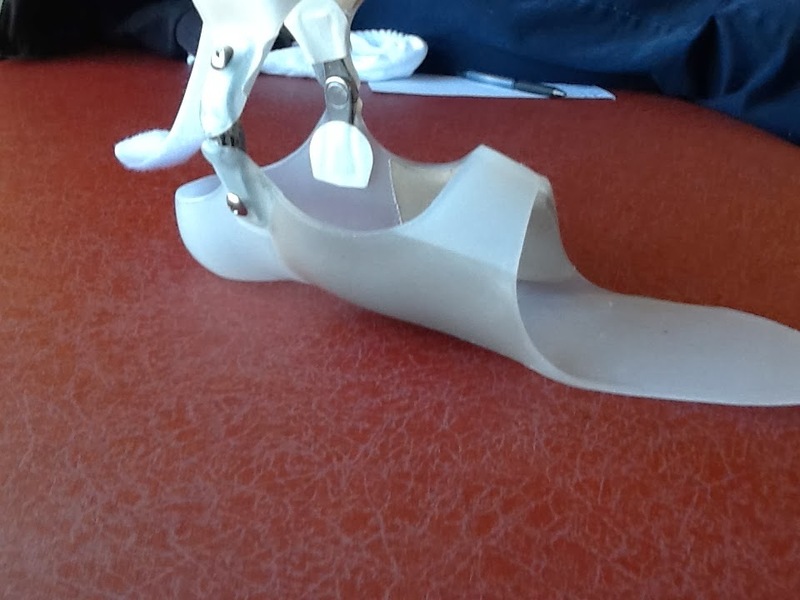 Here an Inverted Orthotic Positive Device is being made for the right side. See how the high point of the arch under the first cuneiform, not the first metatarsal base. This is crucial at not blocking first ray range of motion. This is opposite of our video where the left is flatter. 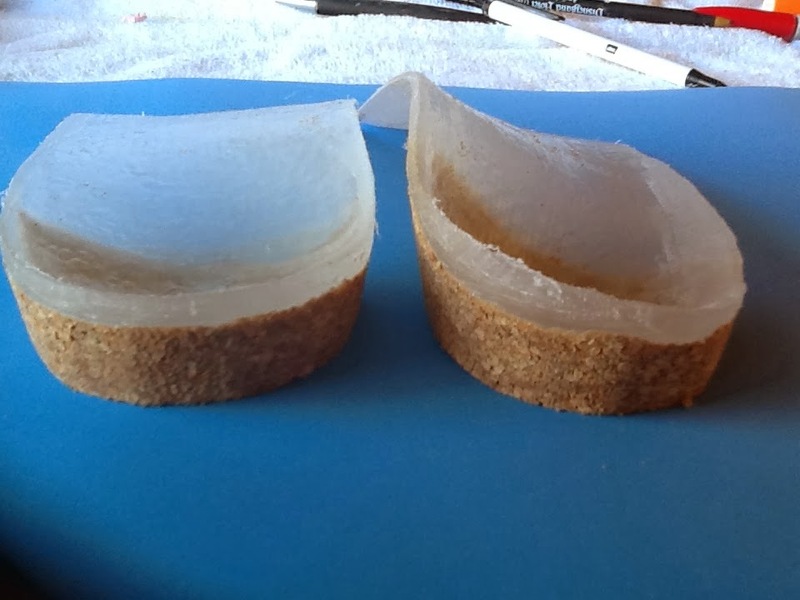 Here is a pair of orthotic devices designed to correct more for the right side with an Inverted Orthotic, over the more traditional Root Balanced Technique on the left. It is almost a year later since I first wrote you, and I wanted to update you. I went to a podiatrist who said I had to have surgery and gave me a cortizone shot which did absolutely nothing. I then managed to get in to see a podiatrist whom works with our local celebrity Orthopedist in Birmingham, Alabama. He took xrays (nobody has even suggested taking an MRI) and pronounced surgery the only option... total fusion. I wouldn't be able to do anything for 11 weeks....WHAAA??? It's my right foot so (unless I purchase a British car) no driving. I can't remember how much of the 11 weeks I'd be almost completely immobile because the whole conversation sent my mind reeling. Dr Blake's comment: Typically, you are totally off your foot 10-12 weeks with a fusion of any joint, since it takes time for the fusion to take. You can use Roll ABouts and Crutches, but no weight bearing. Then, you start the 3 months of gradual to full weight weightbearing with some physical therapy. So, 6 months after surgery, you typically are close to where you were before only with no pain in the big toe joint. I have tried contrasting baths which has offered lessening of pain somewhat, but not much. I am definitely pronating and the old hips and knees are sure to suffer. I have also gained at least 10 pounds in a year due to lack of movement. I will definitely increase my Vitamin D intake and head out into the sunshine, but wondered what else I can do. a) Do you know a physician/podiatrist/witch doctor in this area that won't immediately head for the default setting of fusion? Dr Blake's comment: Try going to the AAPSM website and look for podiatrists in your area. Typically these are podiatrists who are sports minded and less surgically minded. At least a starting point!! b) Where can I get the best (and hopefully not too $$$$) orthotics? Dr Blake's comment: AliedOSI labs in Indianapolis, Indiana. They are a big national orthotic lab. Talk Kathy Dubois and mention my name and your need to locate someone near you. I think this is a good starting point. She is wonderful!! Dr Blake's comment: See if you can get Voltaren 1% Gel prescribed which you apply 3 times a day, along with Icing 10 minutes 2 times per day. There are many compounding creams/lotions that may help more, but you have to experiment and they tend to be costly. d) Should and where can I order a boot to calm ornery toe joint down? Dr Blake's comment: Definitely, these boots need to be part of your wardrobe when the joint gets flared up. As soon as it does, go to the boot to calm things down. Wear 3 days longer than you think you need to. My current favorite is from Ovation Medical. The idea of a fusion sounds insane and having read a lot from your blog; it sounds like the surgery is just the BEGINNING of more problems. Dr Blake's comment: I am not as sour on big toe joint fusions as I use to be, but the patient must be very carefully selected and informed on all the choices/possibilities. There is no going back, so that bothers me. It completely, and suddenly, eliminates all big toe joint ROM and that bothers me. It is the sudden loss that I find the body has a hard time dealing with, not the gradual loss as you naturally go from Hallux Limitus to Hallux Rigidus. That being said, we are adaptable creatures. We can do this, but it can be a great challenge. I have never seen a study, although it probably exists, to look at the common body compensations and resultant problems after big toe joint fusion. Fuse if it must be fused, but make sure every i is dotted and t crossed before making that decision. Dr Blake's comment: I just love you and your humor. Good for you, because you have to be able to laugh at the situation, yourself, and anything else that tickles your fancy!! If you have only 10%, or 6-8 degrees, fusing the toe is less traumatic to your body than if you had 30 or 40 degrees. The pain is obviously pretty severe because coming from a physician's family, we, of course, never ever seek medical advice unless we are at death's door. From the first orthopedic visit over three years ago, where the doc said take Moebic and then return for surgery when I can no longer stand it (NO mention of boot, orthotics, otc gels...said there was nothing I could do.) ,to the podiatrist who loves cortizone and surgery to the Sports Med guy who insists on total fusion; I'd say I wish I had sought help earlier, but it looks like everyone would have opted for a "wait and see...and suffer" approach anyway. I do not want this surgery, Dr. Blake. If there is anyone in the Alabama or Georgia area (how bout the entire Southeast) you could recommend, I would gladly limp over. Thank you so much for this blog. It's giving people hope and probably years of surgery/pain free feet! Have you ever seen anything this strange? 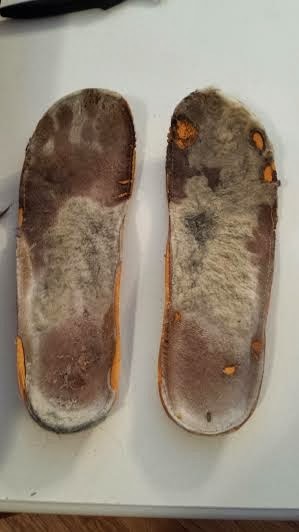 When I started having forefoot pain I took out an old pair of insoles and saw this. My pain is actually centered right at the spot on my right foot where the wear spot is at the base of the 2nd metatarsal. It just doesn't seem possible to have that right foot pattern. PS. The greater pressure on the right, even though considered normal pattern of weight distribution, could indicate that one leg is longer than the other, but that could be mindless wondering!! Piriformis syndrome is quite common in the athletes our Sports Center treat. I have another few posts on this syndrome. Since the piriformis muscle/tendon is an external rotator of the hip, and since excessive foot pronation can cause excessive internal rotation of the hip, podiatrists are called on to design orthotic devices to correct that. If the hip internally rotates too much, the external hip rotators must overwork to stabilize the hip, and the piriformis may strain, swelling, tighten and irritate the sciatic nerve. Here is a wonderful video on combining piriformis stretching with neural flossing (see my other posts on neural flossing). Do these gently at first to see if they have any negative reaction. Or, review with your physical therapist on some modification that is tailored to you. But, sufferers of piriformis syndrome will be helped with some version of these wonderful exercises. Good luck! As you can tell from another post on neural flossing, I personally prefer spine neutral stretches with the patient laying on the back. Also check out this incredible video about the San Francisco Fog!! "I wish I had a dollar" as the old saying goes "for everytime a patient with hamstring injury is doing stretching, but does not know the difference between upper and lower hamstring stretching". This is especially important when the hamstring injury is in the upper part by the buttock. I had contacted you back in May or June for some advice regarding a fractured left tibial sesamoid. Following your advice, I got an MRI, which ruled out necrosis (yay!) so I continued on with conservative treatments. I have been using a bone growth stimulator nightly for about 8 months. I was in a removable boot from March to August and then went to rocker sole shoes with an orthopedic insert. I did PT to strengthen my ankle and foot after coming out of the boot and have recently started to work on your walk to run program. I'm up to 7 minutes walking/3 minutes running x 3, and while it's taking me about twice as long at each level, I am making progress. I got a follow up MRI this week and it showed no more swelling around the bone and bony bridging of the fracture. So, I'm just writing to report a case of going the conservative (extremely patient) route working. It's been tough, but it's worth it to me to keep the bone and hopefully one day be back to full activity without pain. Dr Blake's comment: You are welcome. I am so happy for you. Please continue to ice for 10 minutes 2 times a day, and continue the bone stimulator for 2 months longer than you think you need to. Glad the Walk/Run Program is safely returning you to activity!!! I love Budin Splints to stabilize the 2nd metatarsal phalangeal joint. In this images, I am failing at my goal. I need to get the 2nd metatarsal down more, so that when the patient stands, the second acts as a stabilizing force against the first. If the second can be brought down with a tighter fit, or my changing to a double Budin Splint, I will have achieved a more stable first ray. 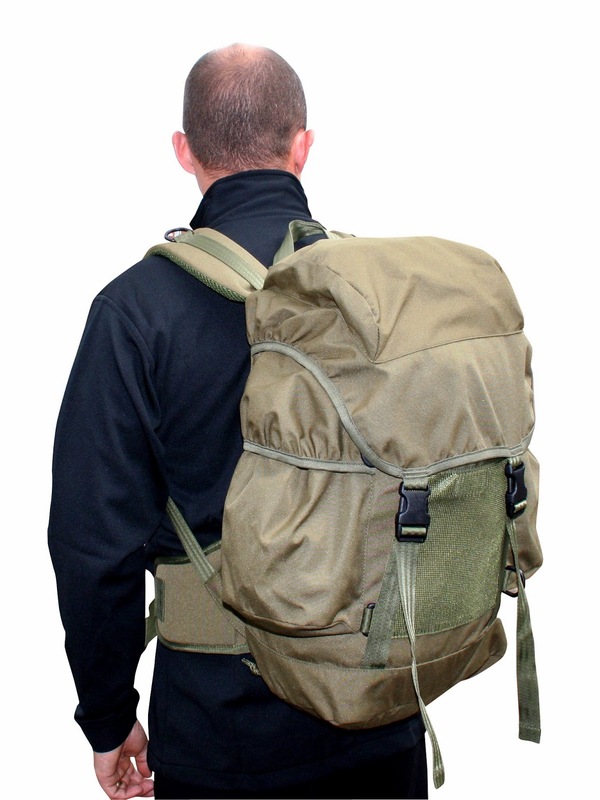 The more stable this medial column, the more stability and comfort there will be in the body. There are so many causes of peripheral neuropathy that podiatrists see affecting the foot. The classic causes are diabetes, osteoporosis, alcohol, Vitamin B deficiencies, but we all know that there are many other causes. This article abstract documents the potential relationship of gluten sensitivity to peripheral neuropathy. Gluten is in wheat. 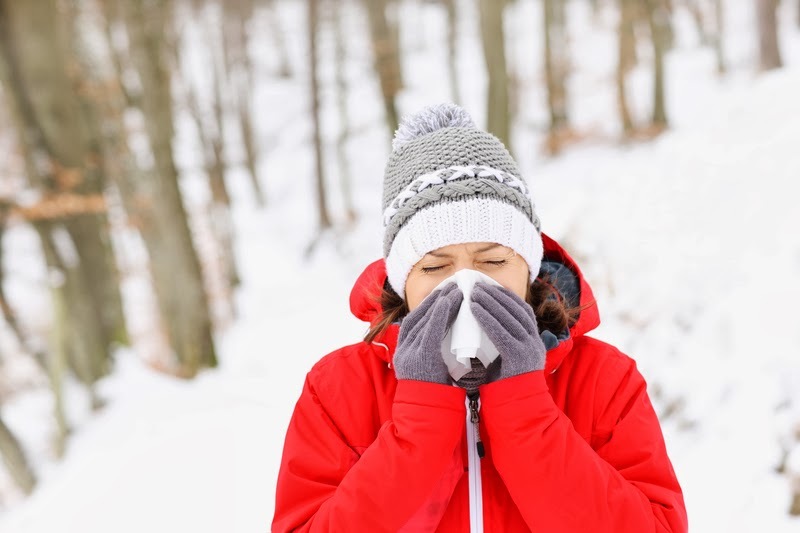 It makes sense that anything that increases our overall inflammation could lead to neural inflammation and therefore, peripheral neuropathy. Podiatrists finally win the Fashion Game: Nothing Else Needs to be said!!!!!! Does Dr Blake have his pulse on fashion or what!!!!!!!! Thanks, what do you think of the alcohol injections for Morton's Neuromas? Do they work? I am looking to try the alcohol sclerosing for my MN. It will be a 0.25ml ultrasound guided injection with 4% alcohol. The podiatrist is looking to do 5-7 shots at 2 weeks apart. What is your take on the alcohol shots and are there any side effects or concerns? Thanks for the information. I think my podiatrist in Arizona ordered the 4% solution and wants to start them and space out the shots every 2 weeks with a limit of 7 shots total. Is it necessary to wait 2 weeks between shots? You do them weekly with no adverse results. Why do some wait 2 weeks? Does the higher alcohol content (6-8%) have better results? The alcohol solution is on back-order here in Arizona (1-2 month wait). How do you make your own? It's basically diluted alcohol, right? There are many times I use Kinesiotape or Rocktape to circumferencial wrap the arch area. In this case, the patient was recovering from a 5th metatarsal base fracture. 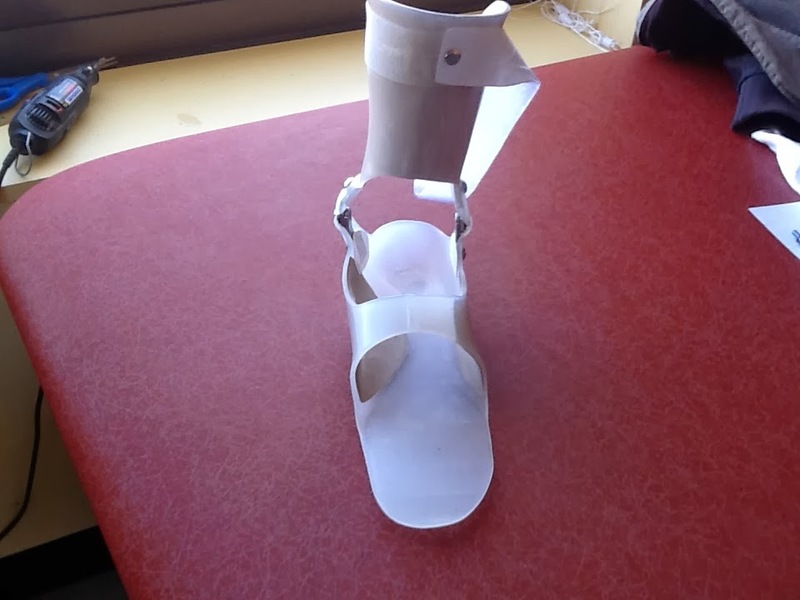 The patient was weaned off of the removable cast and now in orthotic devices and circumferencial wrapping to stabilize the 5th metatarsal base as activity was being increased. The kinesiotape was important for stability but irritative to the sore area due to the pressure. This was resolved by when first putting on the tape cutting a window in the tape even before the backing was removed. Then apply the windowed area over the sore spot first before applying it to the rest of the arch area. In this way, you can have your wrap for stability without irritating the underlying area. I am struggling with a patient who has nerve problems in her foot. Her problems have arisen from many areas, but the clonus (involuntary muscle contractions) with unusual gait disturbances set her apart. She has neck issues also which I assumed were separate from the foot, however I knew they were adding to the overall neural tension in her body. One of her recent consults suggested Cervical Spine Myelopathy as a cause of her foot issues (or at least an aggravating factor). No one has suggested this before to my knowledge. But, it makes sense. She is probably reading this, and we need to have more discussions. Not sure how to prove the foot to neck correlation, but the symptoms and objective findings of clonus/babinski, etc, are all there. If not for my patient, other patients with difficult to diagnosis foot problems, with unusual nerve symptoms, and with neck problems, may have this correlation of foot to neck.